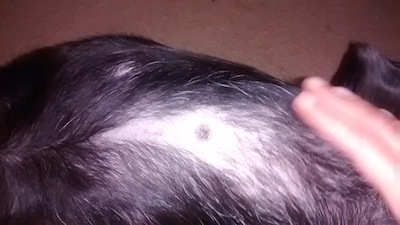 Black spot on dog's chest. My Dog recently got this black spot on her chest. When I first looked at it, it looked like there was a hole in it. Then the next day where the hole was it just looks like dry skin. One area is slightly raised. She lets me touch it and it doesn't seem like it's affecting her. There's no redness, swelling, weeping or itching. It has been there for about 2 weeks now with no change. I just figured it was a new mole. I sent 2 pictures of it to the email address. I would like to get an idea of what it could be and if it could be serious. At the same time I don't want to freak out and rush her to the Vet and pay 100+ just for them to say its a normal mole. My gut instinct is that this is nothing to worry about. It may be some type of a scab from a scratch. If this is the case then it should go away on its own over the next week or so. It's also possible that this is a localized area of infection although it doesn't look typical of this. If it is getting larger or red and inflamed then I'd have it checked. I think that this is unlikely to be cancerous but I can't say for certain without doing tests on it. 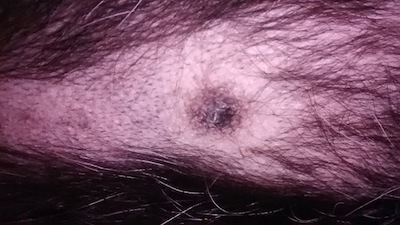 We do see melanomas in dogs, but they don't usually look like this. At this point I would keep an eye on this and if it gets much bigger, red or starts to ooze then I'd have your vet check it out. Thank you so much. I just checked it again and still no changes. I plan to just watch it but so far nothing alarming has happened. This gives my mind some peace.